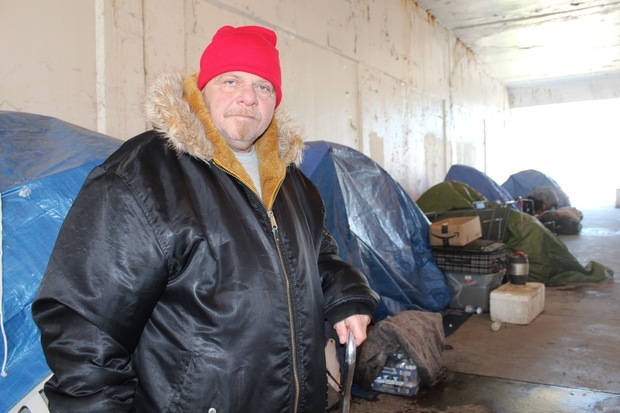 John Little has lived at the encampment under the Wilson viaduct for five years, he said. UPTOWN — For the last five years, John Little has lived "off-and-on" in the homeless encampment under the viaduct at Wilson Avenue. In between, his case manager has found temporary solutions, but he's always ended up back among his neighbors in tents under the concrete shade of the viaduct. Over the years, things have changed, but what has always been consistent is good Samaritans offering their help with food, clothing and other necessary services, he said. "I've been here since before they put tents out here," said the 56-year-old known as Little John in the community. "People keep coming down here saying they want to help us, but they want us to leave our stuff. For the people out here, that's all we got." Tuesday afternoon, he emerged from under the heavy blue tarp that covers his tent swaddled in layers of jackets for a cigarette. The encampment was empty except for a woman crocheting next to her boyfriend and the dozens of tents. Soon, it just might be empty. Last week, Ald. James Cappleman (46th) announced plans to rid the city of homeless encampments by doing something that's "never been done in the city before": move them into homes. "These individuals won't go to the shelter, they will go to permanent housing," Cappleman said at Thursday's Beat 1913 CAPS meeting for the Town Hall District. "You will see the results soon." Cappleman was scarce on details for the plan, but said the idea stemmed from knowledge the city gained by housing veterans. At the end of March, Mayor Rahm Emanuel announced a task force to reduce homelessness with Family and Support Services Commissioner Lisa Morrison Butler at the helm. The program grew from initiatives aimed at curbing the homeless problem among veterans, she said. The task force includes 15 city and state departments who encounter homeless Chicagoans at different places — on the street, trains, hospitals and public libraries. The goal is for all those places to work together to tackle homelessness by asking "Are we maximizing the human and financial resources that we currently commit?" Butler said. The plan sounds great "as long as they're actually going to do it," Little said. "It's going to help a lot of people. ... You got 30 people down here, 30 at Lawrence Avenue and I don't even how many people at Foster." 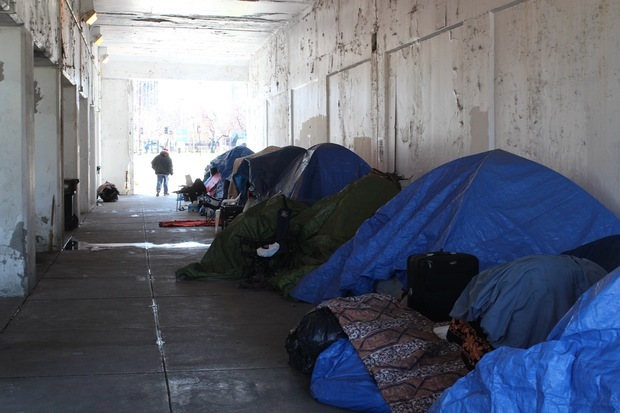 Just Tuesday, the city picked up about a dozen homeless people camped under a viaduct at North Avenue in Wicker Park to clean the space and get medical treatment for those who needed it. Cities across the country have focused on housing veterans because of federal support, but it has also taught officials the expense of people living on the streets, Cappleman said. "Medical care quadruples when someone is living on the street," he said. "We’re finding that one way to bring that cost down is to use a housing first model with wrap around services. When we do that it’s actually much cheaper because there's fewer hospitalizations, fewer psych admissions, fewer arrests," Cappleman added. According to Crain's, which first reported the housing-first program, seven of 10 recurring visitors at the University of Illinois Hospital are "chronically homeless" and come to the ER there between 30 and 120 times per year. In October, the University of Illinois Hospital & Health Sciences System partnered with the Center of Housing and Health for a pilot program aimed at moving "chronically homeless individuals directly from hospital emergency rooms into stable, supportive housing and provides intensive case management," according to its website. The healthcare-and-housing initiative program, Better Health Through Housing, resulted in a 40-to-72 percent reduction in healthcare costs, according to the Center. Aside from housing, the homeless individuals are given case managers to help schedule medical appointments, manage money and refer them to other services. Jessie Beebe of the Center of Housing and Health said the program has helped reduce emergency room visits for the hospital in just 18 months. Cappleman said the hospital's success sparked the city's interest in a "housing first" program. "They started talking about the housing first model. [That it] can actually save the city and state a ton of money so I wanted to push that with the city of Chicago," he said. Cappleman pointed to a federal report titled, "Ending Homelessness for People Living in Encampments: Advancing the Dialogue," which was written with input from homeless advocates, service providers and government officials from across the country. "To end homelessness for everyone, we must link people experiencing unsheltered homelessness, including people sleeping and living in encampments, with permanent housing opportunities matched with the right level of services to ensure that those housing opportunities are stable and successful," the report said. The "very powerful document" laid out a step-by-step plan, which involved all the stake holders, Cappleman said. "Up until last fall, we had all these people fighting about homelessness and some of us got together and said let's stop fighting and let's focus on some solutions," adding some of the tension was between the Chicago Coalition for the Homeless and himself. "There’s been some tensions in the past, but we agreed this document needed to be followed. It just laid out the ground work." Eithne McMenamin of the Chicago Coalition for the Homeless said the city is actually listening to what they have to say. "Our involvement was making sure whatever process takes place that all stake holders voices are included," she said. While the permanent housing hasn't been identified yet, one of the key concerns for the homeless was where the housing would be ensuring "it's not a matter of running them out of the neighborhood," McMenamin said. "They're interested in staying in the neighborhood, but ... they're not interested in housing anywhere else. They have networks, relationships. ... Part of the commitment at the first meeting was getting housing in the same area and the alderman agreed with that," she said. Jackie Partington has been in Uptown since 2009 circling through shelters such as Cornerstone Community Center and Sarah's Circle only to leave on her own accord for the encampments. "I don't like a lot of people there... I rather be out here than with the people over there," she said. "Shelters don't give you cooking [opportunities.] You can't take shelters without people around you. [I'd] rather have my own." Partington said she's heard from Cappleman as he addressed homeless at the viaducts and "hopes" the city's solution works. Either way, she's all in. "I just want housing ASAP. ... We've been here for more than long enough," she said.